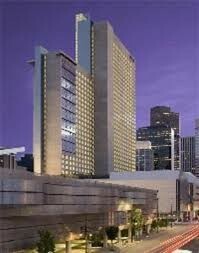 Enjoy an exceptional lodging experience at Hyatt Regency Denver at Colorado Convention Center. Our hotel features well-appointed guestrooms and spacious suites with Hyatt Grand Beds™, personal service, and an extensive array of amenities. Take a swim in the indoor heated lap swimming pool, exercise in our 24/7 StayFit™ gym or indulge in pampering spa services. Business guests will appreciate the onsite business center, expansive meeting space, and close proximity to the Colorado Convention Center and 16th street mall. Savor inventive cuisine at Altitude or relax with your favorite cocktail at Peaks, a trendy lounge with breathtaking views of the Mile High City. A convenient location makes it easy to access 16h Street Mall as well as the incredible selection of arts, entertainment, and sporting events nearby.